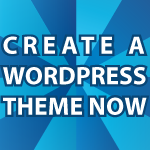 Here I’ll show you what goes into Creating a WordPress Theme. I previously showed you the HTML of a WordPress Theme and the CSS of a WordPress Theme. Now you’ll learn how to turn that website into a real working theme. Here is a link to a zipped version of this sample theme. It is about 95% complete. You can use it in anyway you’d like, but I guarantee nothing. This is the first video tutorial on how to make a WordPress theme from scratch. I hope you enjoy it. All of the code follows the video. In the next part of this video I’ll finish up the CSS required and then you’ll be an expert. Leave questions and comments below. The downloaded zip version fixed the errors… i was cutting and pasting from the web page here. Good to hear that. I triple check the code so I know it works. It’s a shame that I have to use security that messes up the code in the article, but that’s the way it is. I hope you like the theme. It is super stripped down and pretty easy to understand and edit. You’re welcome 🙂 Stick in there. It starts out with me explaining how twenty ten works, then the database, but I create a theme from scratch in part 4 and then onward. Hi Sir Derek, I’ve been following your wordpress theme tutorial and I’m wordpress theme tutorial 7 but it will appear on the wordpress featured content. I need the continuation the wordpress theme tutorial 7. Thanks and I really appreciate your tutorial, helps me a lot bcoz I’m a beginner. Thanks so much for your great videos. I followed through all the videos “How to layout a website” and was sailing along coding my website on my local host line by line with you. I did have to pause the video quite often, but it was the best learning experience. I did really well building my wordpress theme. I installed wp loaded my theme, created some content and everything worked perfectly except for one thing. I can not for the life of me figure out why no post excerpt is being displayed. Post title displays,image displays,date displays and even more, but no excerpt. I followed the NTT-Cindy theme. Have I messed something up? Any help would be greatly appreciated. Here is “my” version of your code. Thank you 🙂 I’m happy that you were enjoying the videos. On thing you need to do is to put the excerpts in the excerpt box for each post. That is an easy thing to have missed. Did you do that?